Offering a full breakfast served in the dining room this Pagosa area bed and breakfast also offers guest suites with a fireplace. The Natural Hot Springs are less than 10 minutesâ?? drive away. A seating area and en suite bathroom are available in all guest rooms at Elkwood Manor Bed & Breakfast. Free WiFi is also included in all uniquely furnished rooms. Free drinks and appetizers are available each evening at Elkwood Manor Bed & Breakfast. A hot tub is on site and a movie library with over 600 movies is offered for guest enjoyment. Wolf Creek Ski Resort is 30 minutesâ?? drive from the bed and breakfast. 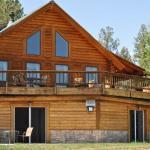 Historic Downtown Pagosa is 3 miles away.